Very dissappointed with this product. Had to use a lot for each treatment so won't last long. Difficult to wash out of my hair (probably not helped by the accompanying shampoo which left my hair very course and tangled). Didn't think it made any difference to my scalp. All in all a waste of money and wouldnt recommend. Got this product initially in a gift box & I love it. Scalp is left all tingly & I can go far longer between washes due to lack of itchy scalp! Some comments say that it is difficult to wash out but I haven’t experienced this- I’m quite happy to stamd under the shower head & continue to exfoliate to get it all washed out. I received a sample of this in my glossybox and figure, give it a go nothing to loose, well the smell is incredible very natural not synthetic at all, and it honestly does work! Feels a bit odd initially with the grit as its like a face scrub but it washes out of my hair fine and any left over bits after a shampoo disapear after conditioner, there is a noticable difference after using the sample for around three weeks twice a week, not much length if any but it has only been three weeks, there is a much more noticable thickness to my hair which is very damaged broken and thin, yes its not the cheapest but you obviously get what you pay for here, i have since ordered more of the scalp scrub some shampoo conditioner and the serum and it all has that amazing smell. I had a sample of this in an advent calendar and just bought the full size because I love it so much. I have dyed blonde hair and so switch between purple shampoos and moisturising shampoos when I was my hair, and neither left my scalp feeling clean. After using this before my shampoo my hair, especially my roots, feels so much cleaner and stays fresher for longer. It's also really good for both oily scalps and dry scalps. A great product if you want a squeaky clean and looked after scalp and a bit of extra volume in your roots. Feels very nice and cool when applied, doesn't irritate the scalp at all. Only downside is washing those tiny scrub bits out. I read about this product in Elle and had never really thought about needing to exfoliate myself but it actually makes complete sense! My hair feels totally refreshed and lighter on my head when using this and I get through an extra day without washing. Definitely a new part of my routine! I am in love with this product! It smells gorgeous and leaves my hair looking fantastic - can recommend to everyone! 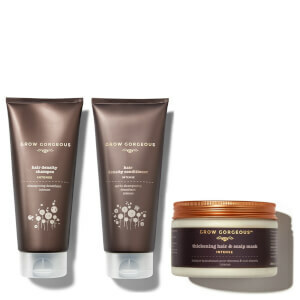 The smell of all GG products is divine...I personally love the smell as does my husband (I've used the growth serum and 11 in 1 cleansing conditioner). This is a new and innovative idea in cleansing the scalp to promote hair growth and am personally trying to grow my hair as long as possible so am open to trying all sorts of ideas. My only negative comment on this product may be that exfoliating the scalp did tend to pull some of my hair out whilst rubbing in circular motions but I have quite fine hair so that may just be a result specific to me. I'll continue to use and fingers crossed this works in conjunction with a healthy diet and other hair growth supplements I'm using. I'm an avid dry shampoo and texturising spray user and i can always feel the product build up on my scalp- this is the ultimate solution! It smells amazing and it's left my scalp feeling so much healthier and my hair feeling and looking bouncier! !